Thirty plus Caterham Superlight R300 racers came to the Silverstone GP circuit keen to establish the new pecking order for 2010. With race one abandoned following four crashes within the first three laps, race two became the proving ground for challengers old and new. Newcomers Andrew McMillan, Trevor Fowell and Paul Brannan held the initial lead. However the man on the move from his qualifying position of 6th place was the 2009 championship winner Jon Walker who gained a comfortable race victory of just over ten seconds from second place Andrew McMillan. 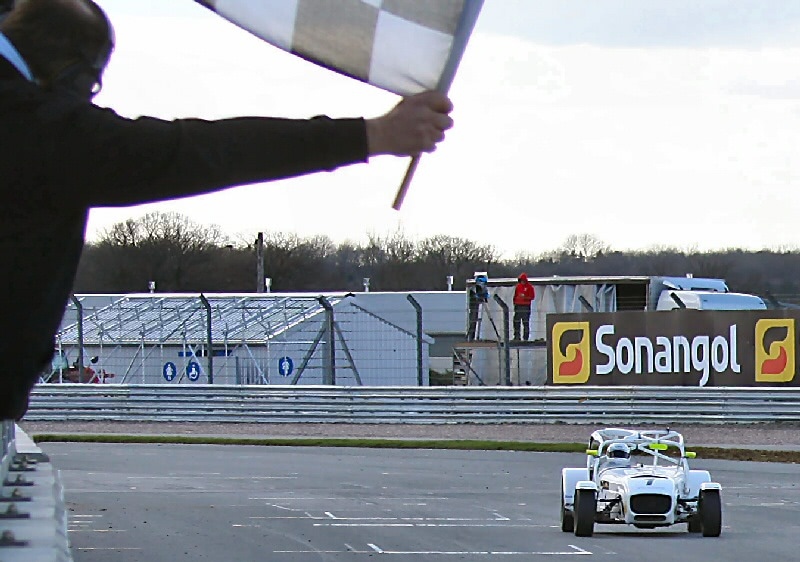 Jon Walker crosses the finishing line on the Silverstone GP circuit with second place driver Andrew McMillan 10 seconds behind. DPR Motorsport team principal Dave Rowe said “Due to technical changes in the 2010 regulations we had to implement a new set-up for Jon and with the uncertainty over the weather we had to plan for both wet and dry options. As the results show, we provided Jon with a car that allowed him to outrun the opposition with lap times around a second a lap quicker than his nearest rival.